Several things can be learned from a careful examination of hay. First, simply looking at the hay can reveal what plant species are present. Does the hay consist almost exclusively of a particular forage crop? Do the forage crop(s) present generally provide good nutrition for animals? Does the hay contain weeds? If so, how much of the hay is weeds and are they of a type livestock will eat and from which they will get some nutritional benefit? Could they be toxic? The maturity of the hay, one of the main factors determining forage quality, can be assessed to some degree as well. The more grass seed heads present, the more mature the seed in seed heads, and the stiffer and more fibrous the stems, the later the hay was cut and the lower the forage quality. Leafiness is important. If hay is highly leafy, forage quality will almost certainly be better than if it is less leafy. Leafiness can be affected by plant species present, by stage of maturity, and (especially in legume hays) by how the hay was handled during harvest. Softness is a desirable trait because, other things being equal, animals prefer soft forage. Softness is usually a result of early cutting, high leaf content, and suitable moisture content at baling. When hay is very soft and pliable, stems and leaves may be difficult to distinguish by touch alone. Soft hay is soft to the touch, but stems can be detected easily. Slightly harsh hay has stems that are slightly harsh to the touch. Harsh or brittle hay is usually stemmy and unpleasant to the touch. Color is a criterion that is important to the average buyer, and is an indicator of conditions during harvest. The hay of some forage species is naturally darker than others. However, with many forage species, a bright green color provides evidence that hay was cured quickly. Quick curing is desirable because slow curing prolongs respiration, which results in a loss of forage quality. Hay that receives rain damage after the leaves are dry will lose color. Mold growth on leaves and stems and bleaching from sunlight will also cause loss of green color (although bleaching has little effect on nutritive value). Baling at a high moisture content can cause high temperatures in the bales that result in tan to brown or black colors. It’s possible to learn something from simply giving hay a good whack! Dusty hay is usually caused by soil being thrown into the hay by rake teeth hitting soil. Hay being excessively dry at baling also can cause dustiness. Visual inspection can detect foreign items that shouldn’t be present. Tools, sticks, rocks, wire, snakes, items of clothing, and cow chips have all been found in hay! Though such items increase hay weight and volume, they obviously are undesirable. 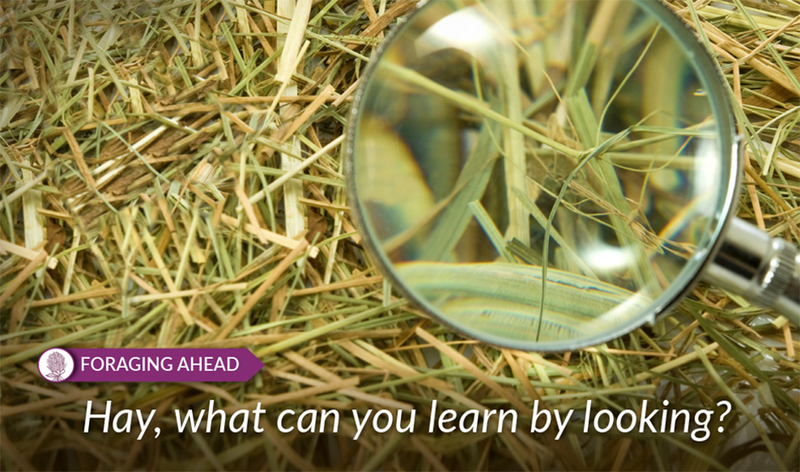 Yes, a person can learn some important things about hay just by looking at it. However, this approach doesn’t do an adequate job of determining the nutritional value of hay. The characteristics that can be observed by touching, smelling, or looking at hay are merely indicators of hay quality and not measurements. Visual examination of hay can be helpful in some situations, but make no mistake about it, there is no substitute for having hay tested.